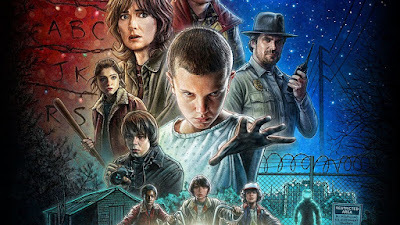 SCARY HORROR STUFF: 11 Classic '80s Films Totally Honored by Netflix's Throwback "Stranger Things"
11 Classic '80s Films Totally Honored by Netflix's Throwback "Stranger Things"
No doubt -- Stranger Things takes the throwback in homage of some of the greatest horror thrillers and dramas of old, back in the day when '80s movies were young and fresh, and it was about an awakening of stories we never heard of. Typically horror well before that had a more adult type of voice to it -- Dracula, The Wolfman, Frankenstein. E.T. the Extraterrestrial -- Arguably, the one movie highlighting a kid delving into the alien unknown. Check out why. Aliens -- No, "Stranger Things" on Netflix didn't exactly have any face-huggers or egg-layers, but they did have a lot of this. The Goonies -- We mentioned Monster Squad already, but this classic film propelled the whole idea of a group of kids on an adventure, and here's why Stranger Things mimics that theme to a tee. Close Encounters of the Third Kind -- Again, Stranger Things sort of hints at the whole alien thing, but these particular themes about aliens stands out even more. Firestarter -- Remember Drew Barrymore (you watched E.T., of course you do). There's a particular character in Stranger Things echoing that same child-like devilish quality. Carrie -- Same here, but more so about the classic Stephen King, as written here. Poltergeist -- Back when ghosts were pretty damn scary without trying to be minimal (like Paranormal Activity, for instance), Stranger Things isn't lacking in that arena much. The Explorers -- When Ethan Hawke was but a babe, his iconic role (along with River Pheonix) was touched on via a particular classic communication device. The Shining -- More classic Stephen King, but mainly due to this other classic scene. Stand by Me -- Hello, it's the '80s when Stephen King ruled with an iron claw, and something about this odd film stuck out for a lot of people, which is why the Netflix series paid homage to this little spot. Commando -- What? An action film by the number one star of his time, Ahnuld Schwarzenegger? You got it. Here's why. A Nightmare on Elm Street -- With no introduction and a healthy dose of cheese, here's why Stranger Things echoed this baby in true form. This is why the series has made such waves on the streaming service. It catapulted Winona Ryder's defunct career like how Marvel/Disney propelled Robert Downey Jr. as Tony Stark/Iron Man. It brought back the fun films about kids and things going bump in the night. When horror movies were not only scary, but also just plain fun to watch. We're talking about everything from "Indiana Jones" to "The Lost Boys" to "Friday the 13th" to "Halloween" and even "Children of the Corn," Other Alien films, too, like the one soon to be released in theaters. classics bringing about the themes of children, teens, and innocence lost. In many ways, making horror way better than some of the frighteners we're currently used to. Don't get me wrong: I love me some Insidious and Sinister with a passion.